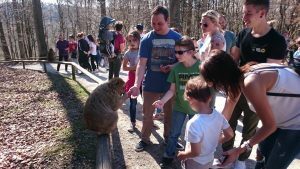 We go by car and the first stop is the Monkey Mountain in Salem, Germany. There is a colony of Berber Monkeys since many decades and the visitors can walk along in the very big compound and feed the monkeys with popcorn. It is so nice to hold a popcorn on the hand and the monkey takes it right away! On this site there are also other animals like ducks, frogs in a pound, a herd of deer and many stork`s nests. These big birds are flying and walking around. So this is avery nice sunday afternoon and since the weather is sunny and warm, we want to visit the wonderful church of Birnau. 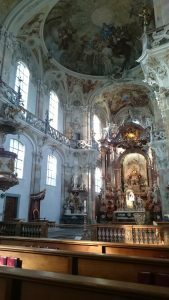 The beautiful baroque church is situated high over the lakeside and the panoramic view is stunning! We enjoy the view, the sun, the churchbells ringing and the calm and beautiful inside of the church. After a short drive we reach Überlingen where we rented an apartment for three nights. The second day we start at the lakeside of Überlingen, just around the corner of the apartment. So many beautiful flowers! The lakeside promenade is quiet in the morning, the perfume of the spring flowers in the air – just wonderful! Walking around the old town we get hungry. There are many shops to by fresh food – fish, meat, bakerys – so everone can get what he wants. Not far from Überlingen is Uhldingen. 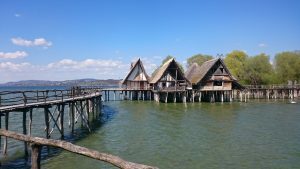 In Unteruhldingen are lake dwellings. We visit stilt houses as they were built in the Stone Age and in the Bronze Age. This is a World Heritage Site of the UNESCO and shows the life of the people at that time. You can learn how the buildings are constructed, see tools and jewellery. In some houses the life of the inhabitants is vividly shown with lifesize figures and furniture, even with stuffed animals. We spend the whole afternoon there and afterards we enjoy the sun going down at the promenade of Überlingen. 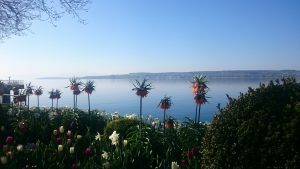 On the third day we drive to the largest island of the Lake of Constance, the island Reichenau. It is famous for its monasteries and for fresh vegetables. This island is a World Heritage Site, too. We are lucky that the St. Georges Church is open to visit. From May 1st to September 30th it is closed for visitors. 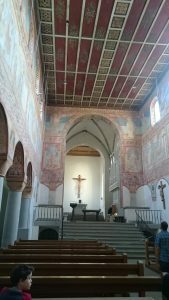 We admire the frescoes covering all walls inside the church. They are more than thousand years old and very impressing. Afterwards we visit the Münster and the church St. Peter and Paul which is located at the end of the island, in the middle of gardens. This is a very calm place. Deeply relaxed we reach Konstanz, a lively town at the Lake of Constance, near the border to switzerland. Konstanz is a very old town, has a university and is a big contrast to the peaceful island we have been before. A little bit of shopping is fun, boosted by coffee and icecream we take the ferry boat across the lake to Meersburg. A short but wonderful passage at the end of a beautiful day. On day four we must drive home, but on the way we visit another beautiful old town: Ravensburg. Cobblestone and medieval houses, not as many people as in Konstanz… a little shopping, nice lunch, icecream… another beautiful, sunny day. Sometimes you must not go far away to have wonderful holidays! << The first journey this year – Skiing holidays in the alps!